Few people get to see their nation's capital as often as Madonna Long. When Madonna visits Washington, D.C., however, you won't find her hanging at the Smithsonian all day. As an advocate for people with disabilities, her calendar is always packed. A former high school track athlete who ran 100-meter hurdles and did the long jump, Madonna, who lives in Greensburg, Pa., just outside of Pittsburgh, sustained a spinal cord injury in a bus accident when she was 18. Now, Madonna uses a Q6 Edge® Power Chair with TRU-Balance® 3 Power Positioning Systems from Quantum Rehab® for her mobility needs. In particular, she benefits from the chair's 10" power lift. "Being able to sit at near-standing height is incredible," Madonna said. "It makes my everyday tasks much easier and activities more enjoyable." In addition to getting her where she needs to go each day, Madonna's Q6 Edge allows her to hold conversations with people and conduct her morning routine more easily by helping her see herself in the mirror. While she was shopping for wheelchair tires one day, Madonna learned of a job opening in Quantum Rehab's Government Affairs department. Shortly thereafter, she was offered a part-time position as a consumer advocate at Quantum. Before getting her Q6 Edge, Madonna used a manual wheelchair, but she was exerting too much energy pushing it each day. "My job on Capitol Hill is very demanding," Madonna said. "The Q6 Edge makes getting around easy so I can focus on the work that I do. Simply put, it lets me live my life on my terms." Madonna says that one of the biggest challenges of her job is educating policymakers on disability issues. "Without education, we can't expect action," Madonna said. "I do my best to communicate the needs of the disabled community to the people implementing Medicare and other health care reforms." Madonna's political background does not end with consumer advocacy, however. "When I was 22, I met Senate Majority Leader Harry Reid of Nevada," Madonna said. "He was a big supporter of the spinal cord research clinic I attended." When she was 28, Madonna ran for Nevada State Assembly, and she and Reid campaigned together during that time. In addition to all of her work on Capitol Hill, Madonna is a mother to four children. They are Tyler, 27; Joshua, 25; Julie, 18; and Tanner, 15. 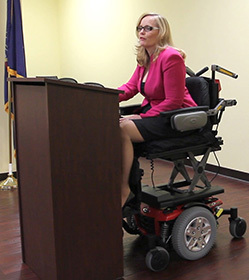 Madonna continues to educate legislators on disability issues, living by a few simple words. "We have a saying in the disability community: 'Nothing about us without us,'" Madonna said. "It simply means that we would like to be involved in the decisions that affect us, and as an advocate, I like to think that I've given us a voice."